On February 19, 1979, five men from the Hawaiian island of Maui – Benjamin Kalama, Ralph Malaiakini, Scott Moorman, Patrick Woesner, and Peter Hanchett—went on a fishing trip on a vessel called the “Sarah Joe”. The boat and its crew all vanished after a terrible storm hit the area. It would seem obvious that the five men probably got lost at sea and drowned, but things got really weird in 1988 when pieces of the “Sarah Joe” were found on an island over 2000 miles away.An unmarked shallow grave was also found on the island where the remains of Scott Moorman were buried under a pile of rocks. However, no trace of the other four men was found, so if they were the ones who buried him, what happened to them afterward? And if they didn’t bury him, then who did? To make things even weirder, this island had apparently already been searched a couple years beforehand and no one found the pieces of the Sarah Joe or the grave at that time. The fate of the four other missing men and the mystery of how Scott Moorman was buried remains unsolved. More than 35 years later, the Sarah Joe mystery leaves us with more questions than answers. This is a maritime story of five strong men who went leisure fishing on a beautiful day in Hawaii but never returned. Subsequently, one of the men reappeared ten years later on a remote atoll in the Pacific Ocean, only to add another twist to the case. This is the Sarah Joe mystery. Maritime history is awash with stories of all sorts of unexplained mysteries and stories. Some of these are precisely that: stories. Mariners that set sail from one port either return to the same one or berth at a different one with wild tales along the theme of ‘the one that got away’. The seas and the oceans of the world are notorious for not giving up their secrets without a fight. The HMS Daedalus sea serpent, Flight 19, Mary Celeste, Amelia Earhart and the Titanic are just a few of the more popular oceanic mysteries from the past century or two. The Sarah Joe mystery began on 11 February 1979 when a quintet of friends boarded a Boston Whaler named the Sarah Joe. This modest vessel was 17 feet in length and had an 85 horsepower engine. It was unequipped for any major sea voyages. When the boat cast off from the town of Hana on the Hawaiian island of Maui, the conditions for sailing could not have been any better. There was barely any wind, and the surface was as smooth as glass. Within just two hours of departure, close to noon, the local weather worsened. None of the five had checked local sailing conditions or the weather reports, preferring to keep eyes on the horizons instead. This is a typical action on the part of amateur sailors that only expect to be out to sea for a matter of hours. Had any of them done so, they may have become aware of a major low-pressure system approaching the islands. If the storm that hit the town was any indication, then the conditions out at sea must have been horrendous and wholly unsuitable for even the most expert of sailors. Gale force winds and torrential rain more than likely tossed the boat around like a rag doll. A number of larger fishing vessels managed to make it back to port and reports suggest that the swells peaked at a height of 40 feet. Even though hope was futile at best, none of the locals and relatives of the missing crew were willing to just sit tight and do nothing. A search of the coastline took place, even though visibility was about as bad as it could get. However, conditions were too rough to search further out until the storm abated. The Sarah Joe mystery fueled a huge search. On the following day after the disappearance, the Coast Guard recommenced its mission. Over time it grew into a large flotilla of ships, boats, and aircraft. For five days, the search covered 70,000 square miles of ocean, but they found no trace of the five men or the boat. The real problem that the investigators had was that nobody knew in what direction the group went or where they ended up. The strong currents of the Alenuihaha Channel didn’t help matters either. They even brought in homing pigeons specially trained to locate people stranded at sea. Almost a week after the storm experts concluded that the Sarah Joe wrecked and sank with all hands on board. Family and friends of the missing men weren’t so quick to abandon their hopes. They pooled their cash and resources and managed to maintain a search for an extra three weeks. Their main focus was on some of the more remote islands in the hope that somehow the boat had made landfall on one of them. No trace of the men, listed below, or the boat could be found. A memorial service was held for the crew, which would go on to become an annual event. With the search being called off, that might have been the end of things. The public had forgotten about the Sarah Joe mystery. It was just another tragedy in a long list of disappearances at sea. However, a decade later several of the original search party members were on a routine wildlife mission in the uninhabited islands of the Western Pacific for the National Marine Fisheries Service. The Marshall Islands and the remote Taongi atoll (a.k.a. Bokak atoll) are approximately 2200 miles southwest of Hawaii. On September 10, 1988, biologist John Naughton put himself in the middle of this mystery for the second time. 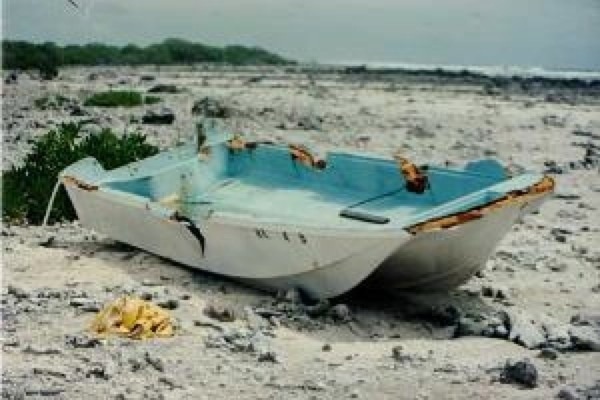 While working at Taongi atoll he came across an abandoned fibreglass boat on the coastline. He could only determine part of the registration of the boat. But it was enough to ascertain that it came from somewhere in the Hawaiian Islands. Further investigation carried out at the time established that Naughton had solved the mystery of what happened to the Sarah Joe. But that just raised many more questions. There was nothing inside or around the boat itself. They looked for signs of life, notes, or any kind of equipment that might provide clues. However, there were none. Naughton and his team took a moment to decide what to do next, and they decided they would search the surrounding area. Almost immediately, the team made another discovery about a hundred yards from the boat. A make-shift cross fashioned from driftwood was sticking out of the top of a shallow grave. Also, a human mandible bone protruded out of the cairn of coral and shingle stones. As they examined the grave closer, they saw blank pieces of paper resting on top of the skeleton. All of this paper was loose but was stacked like an unbound manuscript or book. In between each slice of paper was what Naughton would later describe as tinfoil. The bundle of 3 inch square papers was roughly ¾ of an inch thick. They did not serve any function that the biology team could imagine. The four men collectively decided that any further excavation of the grave might be disrespectful. Thus, they took no additional attempts to proceed. Investigators sent the mandible to a forensics lab for testing. Results revealed that the remains were those of Scott Moorman. Several other smaller bones found beyond the gravesite also matched Moorman. They did not find any other remains on the entire islet. The outboard motor from the Sarah Joe remained missing as well. It does seem likely that Moorman and the boat drifted to the area more by luck than judgment. But what about the remaining crew? No trace of them has ever been found. This leads to the obvious question that nobody has yet provided a satisfactory answer to. Who buried Scott Moorman? One of the more plausible theories revolves around an Oriental burial tradition. Chinese traditionally include in a coffin the provision of small pieces of paper or paper money separated by gold or silver foil. These items are interred with the corpse as a means of fortune for the afterlife. This matches the type of burial the researchers found at Taongi Atoll. Hence, it is possible that a fishing boat from either could have come across the deceased or ailing Moorman. If they were fishing illegally, they may have provided him with a proper burial according to their local customs without reporting it. Now the question has to be asked about the remaining four. Plausibly, the storm took all four men. Perhaps this left the unfortunate Scott Moorman alone in the middle of the Pacific with little to no supplies or much hope of rescue. There is a lot more to the Sarah Joe mystery than the disappearance and reappearance of a single man from five. The Sarah Joe was not the most sturdy of vessels constructed and was really only designed for coastal use. How the boat survived one of the worst storms on record and ended up on a desolate atoll thousands of miles away is quite an accomplishment. Experts that better understand events such as this reckon that the drift time between Hawaii and the Marshall Islands would have been somewhere in the region of three months. That in itself does raise a question or two. Four years before Naughton got to the island, another research team landed there and reported nothing out of the ordinary. Witnessing a discarded boat might seem trivial enough to omit it from official reports, but a grave? So where was the boat between leaving Hawaii on 11 February 1979 and 1984 when the original expedition made landfall on the Marshall Islands? The Sarah Joe mystery endures.